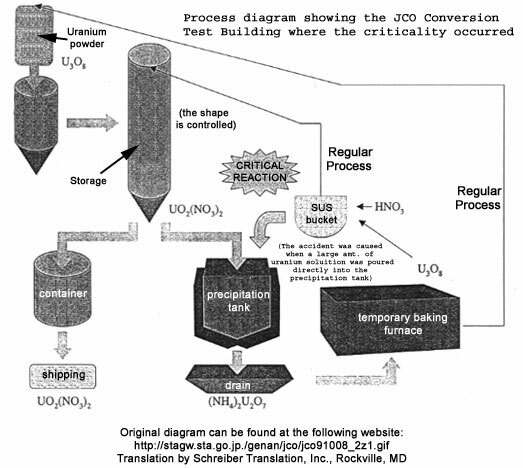 The criticality accident occurred at the Conversion Test Building, JCO, Ltd. at Tokai-mura, starting at 10:35 am Japan time on Thursday September 30. Some reports said that this facility makes fuel for the JOYO experimental fast reactor. The accident lasted about 17 hours. 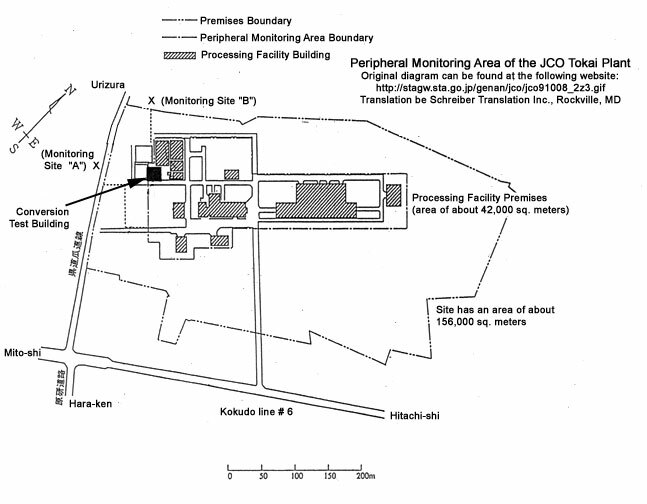 See the full detailed Chronology and Press Reports of the Tokaimura Criticality. The criticality involved about 16 kilograms of 18.8 percent enriched uranium in solution in a tank. The tank is used to precipitate uranium from nitric acid liquid solution. The tank contained far more uranium than allowed for safe operation. The tank should not have contained more than 2.4 kilograms. Because the uranium was in solution, the criticality event proved difficult to stop. Following the initiation of the accident, when nearby workers saw a distinctive blue glow, the chain reaction continued. The IAEA reports that the information from the Japanese is that periodic critical reactions happened throughout the accident. This situation could have occurred if the heat produced during the event boiled the solution, expanding the fluid and creating air voids which stopped the chain reaction. But after the solution cooled, criticality resumed. 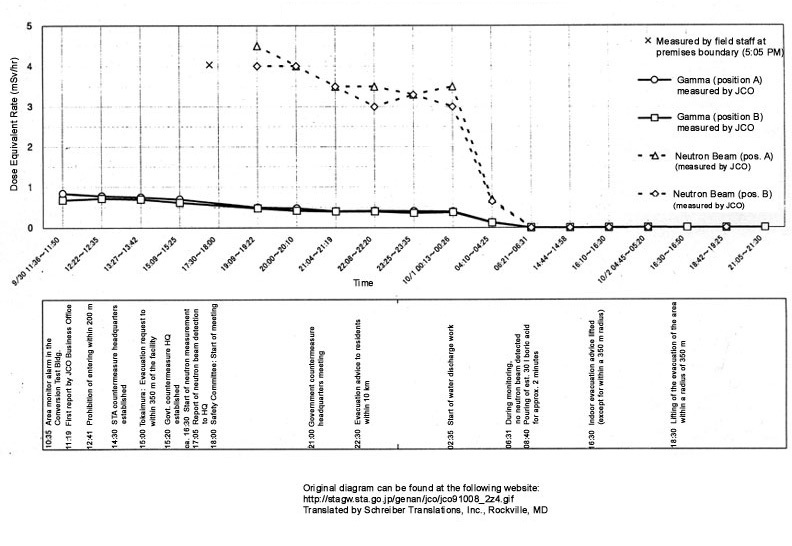 However, other reports and the neutron readings taken at the plant suggest that the reaction during the accident was continuous, although less intense than the initial criticality episode. One possible explanation is that the water cooling system surrounding the container removed sufficient heat to allow the reaction to continue. This type of criticality event is extremely dangerous because it does not necessarily destroy the container holding the uranium. In essence, the container became a crude type of nuclear reactor, but without the customary materials and equipment to keep the reaction under control and protect the workers and public. Plant officials moved to stop the reaction by draining water from cooling pipes surrounding the tank. This water jacket served to cool the tank (and perhaps protect workers against the lower levels of radiation emitted routinely from the tank). However, during the accident, the water in the jacket reflected neutrons back into the tank, intensifying the number of fissions of uranium 235. Once this water was drained, the uranium in the tank apparently could no longer go critical. The criticality reaction is reported to have stopped by about 5:30 pm Japan time on Friday. 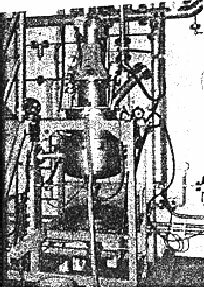 Subsequently, boron was injected into the tank to absorb neutrons and further reduce the chances of another criticality reaction. The total number of irradiated persons under medical observation as of early October 1 was 49 persons. The breakdown is 3 staff irradiated severely, 36 staff irradiated less severely, and 10 nonstaff irradiated less severely (including 3 firemen involved in rescuing the seriously exposed workers). A release of radiation to the atmosphere happened, but stopped. According to the IAEA, the noble gases have dissipated, but radioactive cesium and iodine have escaped the facility. 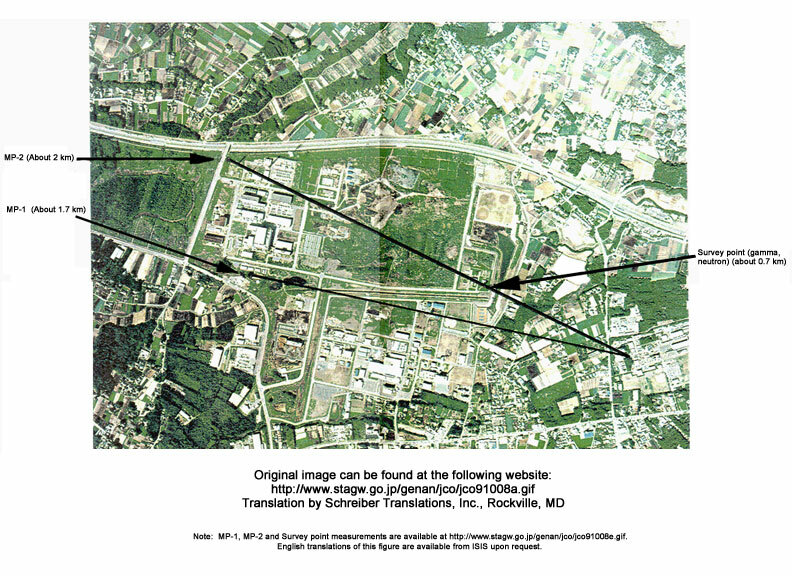 These materials remain a concern, pending the results of more radiation monitoring in the populated area surrounding the accident site. On the International Nuclear Event Scale (INES), the event was given a provisional rating of four, with seven being the most severe type of accident. Level 4 signifies an event without significant off-site risk; however, this ranking may be changed as more information is obtained about the accident, including the level of off-site radiation contamination.